What’s prettier than a flower garden in full bloom? 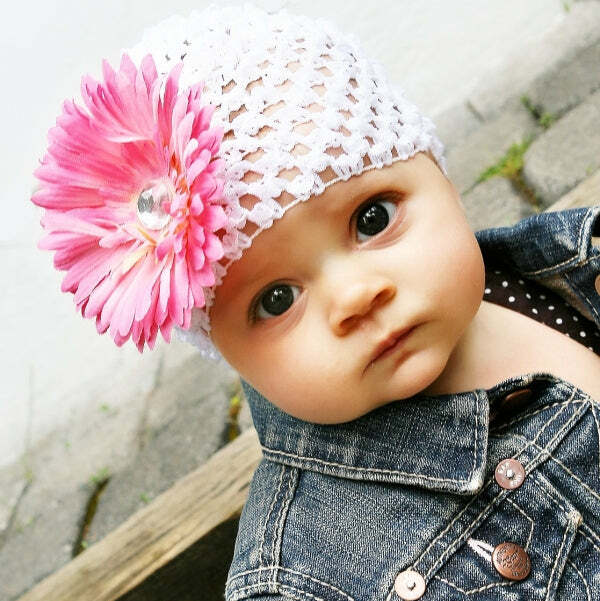 Your baby girl in a beanie hat decorated with a gorgeous flower accent, that’s what. Beanie Design hats for baby girls, complete with stylish blossoms, is the latest fashion trend for framing your little one’s beautiful face. Very popular for infant girl outfits today, flower and bow embellishments add panache and style to our beautiful beanie hat designs, already soft and warm for tiny ears, now a whimsical and fashionable accessory for any baby ensemble. Your little princess’s comfort is our first priority, and our handmade beanie hats mold delicately to tiny heads, adding an extra layer of protection in all weather. Whether your baby girl’s hand crafted flower hat is paired with a casual onesie of a matching or harmonious color, or an elegant christening gown, it’s nice to know she’s accessorized to perfection in a completer beanie with a lovely bloom to accent her features. On christening day, or for her first visit to family and friends, a soft and lovely white knit hat sporting a giant blooming peony that matches her dressy outfit brings out her perfect features and accentuates her lovely face. For mothers who prefer more delicate embellishments, our beanies also feature lovely bows, sparkling bling and smaller blossoms that add dazzle and charm. Our beanies are crafted by masters of the art, who employ the time-honored techniques for hand knitting and crocheting that make Grandma’s creations such precious heirlooms. Colors that cross the full spectrum are featured in our flower beanies, including breathtaking blends of color and pattern that add just the right touch to complete your little angel’s precious outfit. Blending a lovely aqua blue with a pretty polka dot multicolored bow will pick up the colors of your little doll’s outfit, and her eyes, and pull the focus up to her lovely baby face.